I have spoken with evangelical zeal of my love and gratitude for my SAD (Seasonal Affective Disorder) light many times before but since it is that time of year and I seem to be getting questions and emails very frequently asking for more details, I thought I would make it an official WFMW so that I can just refer people to it on an as needed basis. Every Fall my energy and motivation begins to wane. I want to be very still, I want to sleep all the time, I do not want to exercise. I want to eat lots of carbs, I want to be mean to people, I want them to stay away from me, in short I want to be a bear. Since hibernation tends to be frowned upon for mothers in our culture I have had to find a better way. 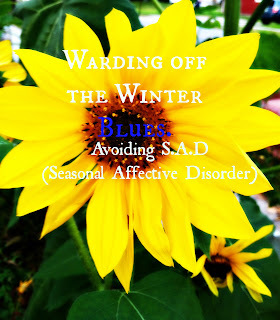 For several years I read about and heard about Seasonal Affective Disorder (SAD) and light therapy (from Dr.'s and therapists with real, you know, Doctor-y degrees). It was clear to me that I suffered from this condition and the idea that the right spectrum of light could cure it made a lot of sense to me. So last Winter, I finally broke down and bought this beautiful thing. I can't think of $120 better spent. I used to actively dread Winter. I loved Fall but my enjoyment of it was tempered by a sense of panic of what was to follow. Yes, panic. I sensed that life as I knew it then was about to end, or at least go on hiatus for a long while, and there was a very real possibility that I may lose many friendships and the ability to fit into my jeans during that dark period. I live in a very dark part of the world (we outdo even Seattle for lack of sunshine) and being a sunny South African native, this wreaks havoc with me. Anyway, where was I? Oh yes, so with the help of The Box my life went on. My energy level was similar to what it is in the summer (sometimes it was increased, the literature that comes with the lamp does warn that excessive use can actually cause mania, so if you are prone to manic episodes you should not exceed recommended dosages-unless you have a lot to do, then have at it. Oh relax, I am no light-pusher I know you will consume your light responsibly). In addition to having energy, my mood and sense of well-being was good, I did not struggle with depression, I did not feel the perpetual need to hunker down next to a heating vent with a bagel, was not tempted to leave an outgoing message on my voice-mail saying something along the lines of "please stop calling because regardless of who you are, and why you are calling, I do not like you, nor am I interested". I was motivated to exercise, I even occasionally folded my laundry (and put it away!) life just went on. Around March when even non-SAD people started to lose their tolerance for Winter, I noticed that for the most part, I was fairly ambivalent regarding it. Summer would be nice, I definitely looked forward to it, but I didn't desperately need and crave it the way I had before. I was busy living life and you know, when Mother Nature (the irrational hag) was ready, I was ready. Like a modern day Florence Nightingale, I would make house calls with my lamp to a friend who suffers from SAD fairly regularly. He would bask blissfully in its glow for a half an hour or so and all would be right in his world again. He found the "high" would get him through several days before he needed his next "hit". This year he got one for his birthday. As for me, I don't take any chances, I sit in front of mine most mornings as I read my scriptures, eat my breakfast, check my email..and all that other morning sitting type stuff. Does it have to be installed somewhere? No it's a little box lamp that you can plug in and sit next to you anywhere. I cuddle up to mine on the couch. Is it big or small? They vary in size but they are all very portable. Do you have to stare right at it to get the benefits? No, it should shine into your eyes but you don't have to stare directly at it. Like I say, I read etc while it is on. Is there anything I should look for or avoid in a lamp? I'm not an expert but my research says that you should not buy a lamp that has less then 10,000 LUX. I am not sure what this means, but I do as I am told. No, a "full-spectrum" lamp such as those sold for crafters etc will not have the same effect. You need to get one specifically made to treat SAD with 10,000 LUX or more. Won't it cause cancer or be bad for my skin/eyes? No. 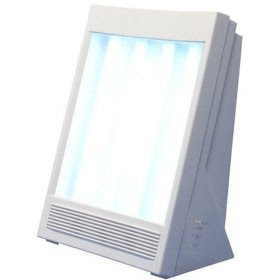 This is not the same sort of "tanning" light that you find in tanning beds and booths. It is safe for your eyes and this spectrum of light is not carcinogenic, nor will it give you a tan. Where did you get it and what type do you have? I got it at Amazon. com. Click on the "this beautiful thing" link above, or do a search for "SAD light" on Amazon. My lamp has ion therapy. This is also supposed to elevate mood and be healthy. I don't know about that. It seems to kick in only after the lamp has been on for a while, (maybe mine is faulty) and it does have a distinctive smell. Lots of people in the reviews complain about that, I happen to really like it and I wish it did it all the time. However that option can be turned on and off and I'm not sure how effective it is anyway. I hope this helps those who get SAD in the Winter. Try it, you'll light it. I am now off to punish myself for that pun. 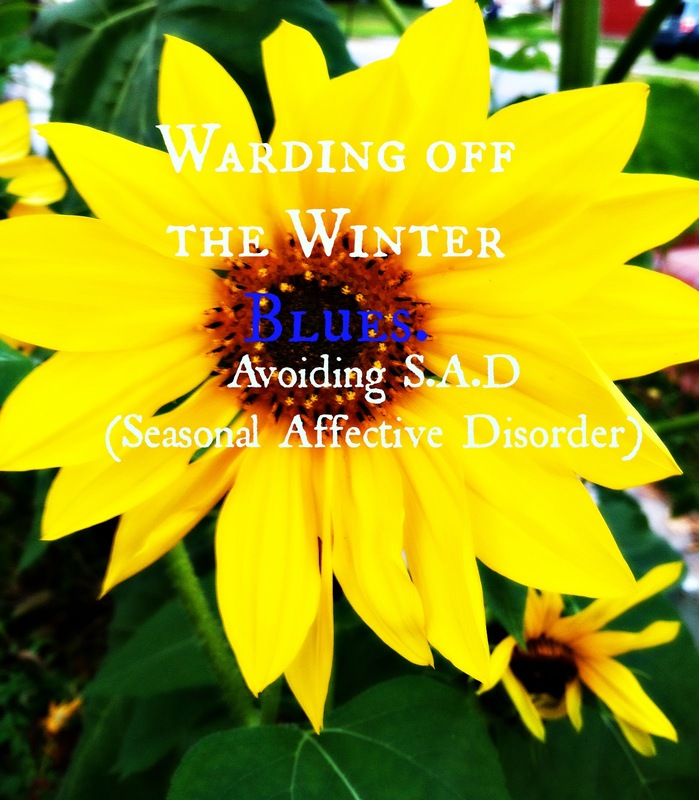 I'm reading: Warding off Winter blues...Tweet this! Kirsty, I am so blown away. An ex-boyfriend of mine used to say to me whenever summer rolled around, "this is your time!" I've heard of these lights but honestly sorta thought it must be some sales ploy and never really looked into it. Thank you for posting this! I understand what you mean about missing the light. Here in England it gets light at about 8am and is dark just after 4pm. I will remember this post when I need it in March. Thanks for your blog, I love reading it. It is great to get to know you all over again. Thanks for commenting on mine. Hope the kids are all better soon. Oh thank you so much for this. I believe I suffer from SAD...even my husband has mentioned it. I will have to seriously look into this lamp. Do I need to be "diagnosed" by a doctor to know if I have this? Because I know all my own issues. I never knew that eating carbs could be part of this! That's what I've been doing over the last couple of weeks (it has been REALLY grey here). Wow, makes so much sense to me now. How interesting ... I always feel kind of "down" from about Jan. until the weather gets better, and I'm wondering if this might help. Sounds like something to buy with my Christmas money - thank you, and thanks for making everything about it so clear. I've heard of this kind of lamp before, but didn't know where to get one. What a great post. I appreciate your humor and authenticity, I think you're going to help a lot of people today. I am pretty sure that SAD is affecting me full force. I am grateful for this post and hoping that I will find one of these under my tree. Love you. I do so love your blog and all the great info and great humor. I was given the Lemonade Award by a fellow blogger and would like to pass it along to you if you so choose to accept. You can read more about it on my money blog. Hope you're feeling less pukey. I told Kent about this and he wants one! He has always said he has "SAD". Although, he doesn't crave carbs. Thanks for sharing that! A lot of people don't know how real SAD is and how easy it is to fix with these lights!